Author: Marchmont Capital Partners at 1:12 PM 0 comments. Concerts in Geneva and Moscow! In Geneva, the stage was the fnac Forum, and in Moscow it was live on TV Rain, Russia’s most progressive Smart TV station! In Geneva, I even played a few new tracks from my upcoming album as well. For the Geneva show I performed with some of the talented musicians who played on the album, and in Moscow with a super group of jazz musicians who I have started working with - in addition to a virtuoso viola player who wanted to join in on the fun! I also featured my music on Jango Airplay and have been thrilled to pick up new fans from all over the world and hear their comments each day. I was in Washington DC in early 2012 where I signed a bunch of CDs for fans who had called in to Blog Talk Radio with host Aaron Myers. I was on the show promoting my “Helping our Heroes at Home” initiative to raise funds for returning soldiers. 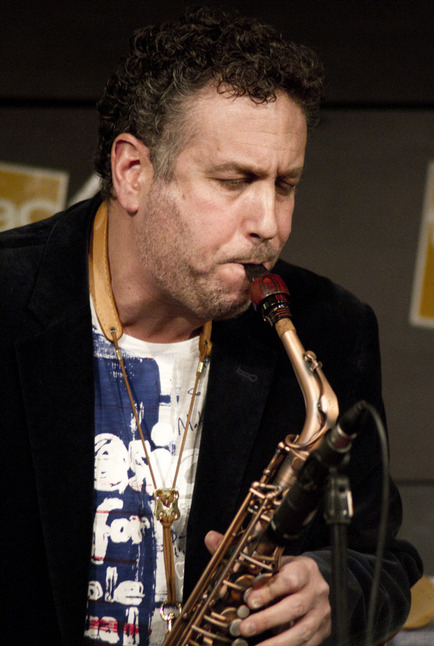 “There's a saxophonist who's comfortable with his feminine side!!! Pink saxophone. Gotta love it” – Tim in New York City, USA. For more information please visit Gregg's personal website. Through the site the artist is reaching out to those moved or touched in some way by his music. Author: Marchmont Capital Partners at 12:29 PM 0 comments. 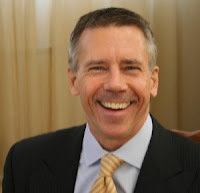 The seed for this Master Class came about from a request of the US Embassy Moscow to me in May 2010. The Embassy was asked by the the Governor of Novosibirsk, Russia to organize a conference on solutions the region could implement to stimulate more innovation, venture capital and entrepreneurship. My 60 minute presentation generated numerous questions that demonstrated the audience’s lack of understanding of what entrepreneurship is, how it and venture capital works, and actions government can implement to spur more innovation, technology creation and investment. 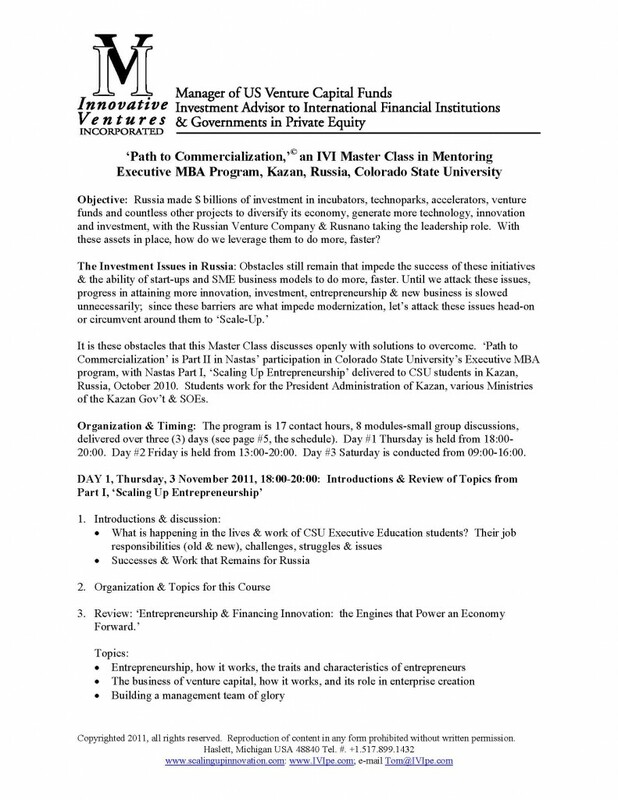 John Hoxmeier, Associate Dean, Graduate Studies at Colorado State University (CSU) learned about the Novosibirsk event and asked me to create a 3 day Master Class around the subjects of innovation, entrepreneurship and venture capital for CSU’s Executive MBA program in Kazan, Russia. Students in the program hold senior positions in state owned enterprises, Ministries of ICT, Industry, Trade & Development, the Tatarstan Presidential Administration and Tatarstan’s sovereign wealth fund with responsibilities to help create more technology and knowledge based companies in the region. 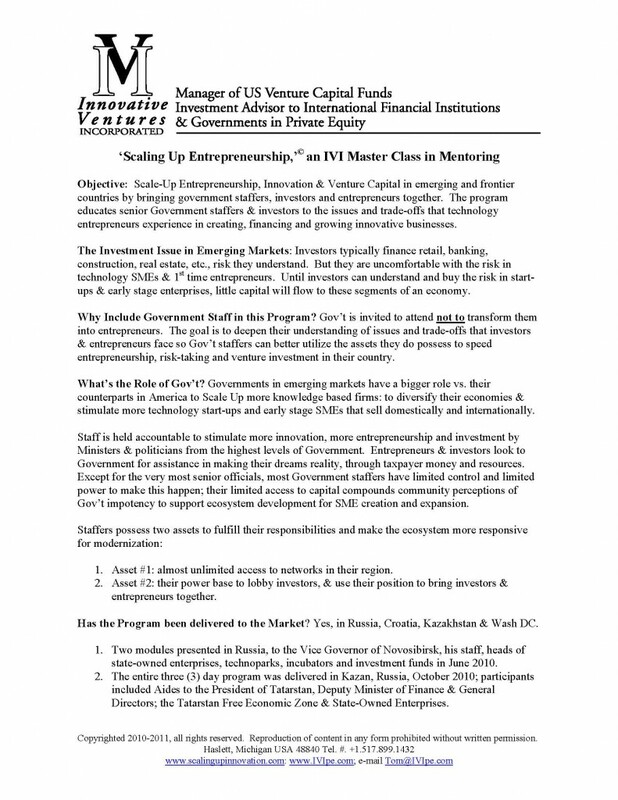 Thereafter I added new content to the Master Class, and I’ve delivered it to staff of investment funds, entrepreneurs, incubators, technoparks, universities, economic development agencies and senior government officials in Croatia, Kazakhstan and the World Bank. Click on the icon below to view the program in English, its content, learning and ‘Scaling Up Innovation’ objectives. Write me at Tom@IVIpe.com to learn more about this program & its delivery in your region or country to stimulate more innovation, entrepreneurship and venture capital. Author: Marchmont Capital Partners at 2:46 PM 0 comments. Author: Marchmont Capital Partners at 11:39 AM 0 comments.